On the night of the Seventh Moon, an English girl wanders into the Black Forest where she encounters a charming stranger. 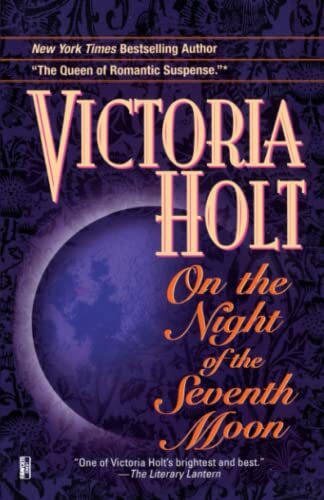 Victoria Holt is one of the world's most beloved writers of romantic fiction. Her bestselling novels include Seven for a Secret, Daughter of Deceit, Snare of Serpents, The India Fan, and The Silk Vendetta. Miss Holt also wrote many bestselling novels under the names Jean Plaidy and Philippa Carr. More than 56 million copies of Victoria Holt novels have been sold worldwide, and there are more than 14 illion copies of Jean Plaidy and more than 3 million copies of Philippa Carr stories in print. Victoria Holt died in January 1993. According to ancient Black Forest legend, on the Night of the Seventh Moon, Loke, the God of Mischief, is at large in the world. It is a night for festivity and joyful celebration. It is a night for singing and dancing. And it is a night for love. Helena Trant was enchanted by everything she found in the Black Forest -- especially its legends. But then, on the Night of the Seventh Moon, she started to live one of them, and the enchantment turned suddenly into a terrifying nightmare . . . "From the Paperback edition."